One of the most important pieces of artwork in the Park, the Osborn Gates were created by renowned sculptor Paul Manship, who is most famous for the Prometheus at the Rockefeller Center Skating Rink. Dedicated in 1953, the gates originally stood at what was then the Osborn Memorial Playground, named in honor of William Church Osborn, former president of the Metropolitan Museum of Art. They remained there until the playground closed in the early 1970s to make way for the museum's expansion of the Egyptian wing's Temple of Dendur. 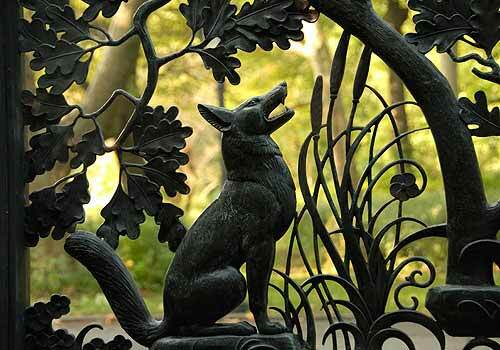 With their fanciful depiction of five vignettes from Aesop's Fables, the Osborn Gates later found a fitting new home at the entrance of Ancient Playground in 2009. The crowning piece of the newly restored playground, the gates' installation marked a feat in their own right: after sitting in storage for nearly 30 years, they were returned to their original glory by Conservancy technicians. Entrance of Ancient Playground at Fifth Avenue and 85th Street.